TUCSON, Ariz. — Safety on the road is a top priority, especially when it comes to kids. This is why the Tucson Police Department, Pima County Sheriffs Department and Tucson Medical Center had free car seat checks at the 15th annual Be Safe event. The purpose of the car seat checks is to teach the community about proper car seat installation and usage. One of the people at the event today, Vanessa Santacruz, said this is her second time at the event checking her two car seats for her kids. She found out at the event that her son's car seat was to lose and her daughter's buckle was too low. "You have to keep checking them as the children grow," Santacruz said. "I mean, adjustments need to be made. They're not going to be the same how they were 6 months ago." Other parents lined up from 9 a.m. to noon Saturday morning to get their seat checked too. 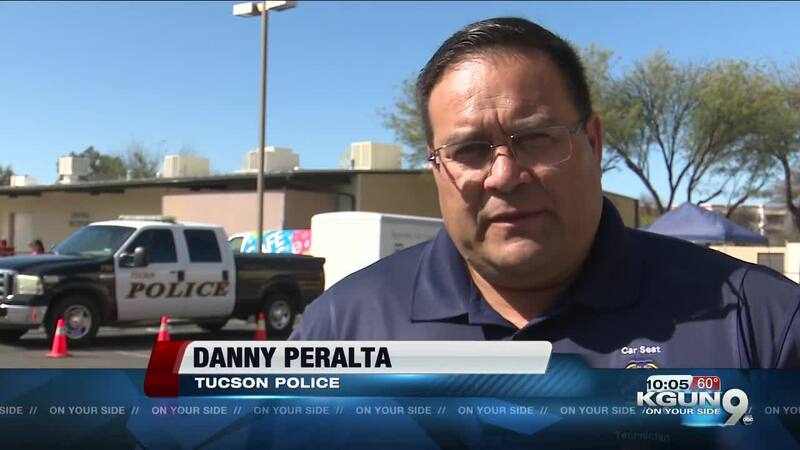 Danny Peralt with the Tucson Police Department said one of the most common mistakes parents make is not keeping their child rear-facing long enough. "When you turn a child too soon, from rear facing to forward facing," Peralt said. "They're very quick to do that not realizing the dangers that are involved. A child is 71% less likely to die in the event of a collision rear facing versus 54% forward facing." He adds that a child should be rear-facing until they're at least 2 years old. However, this varies on weight and height. According to the CDC , an estimated 46% of car and booster seats (59% of car seats and 20% of booster seats) are misused in a way that could reduce their effectiveness, making it more dangerous for kids. "The child doesn't understand how these car seats are put in so it relays on the parent or the caregiver to understand the importance of installing a car seat correctly," Peralt said. Always be aware of loose items in your car. Know where your airbags are at all times. Make sure to tighten the straps properly on your child. Make sure the car seat is locked into the seat. The funding for this event was made available through grants awarded by the Governor's Office of Highway Safety, according to the Pima County Sheriff's Department.